A few years ago James and I saw Grace Cossington Smith: a retrospective at the National Gallery of Australia. Cossington Smith, with Margaret Preston and Fred Williams, is among my favourite twentieth century Australian painters. She was, perhaps, Australia’s pre-eminent post-impressionist. Cossington Smith a paradoxical figure; she lived a quiet, circumscribed life. Yet as an artist she was a brilliant pioneering modernist. As a full retrospective, the show ranged from 1910 to 1971, the full span of her art career, and includes 135 paintings and drawings. It was simply glorious. Cossington Smith drew and painted many subjects, mainly in bright colors, in a manner that was daring and new for her day. Her drawing and perspective are superb, yet she often saw her subjects from an unconventional perspective. She was particularly interested in cityscapes and structures (she did a large series on the building of the Sydney Harbour Bridge in the 1930’s) but also made many fine portraits and some pictures of Australian wildflowers. 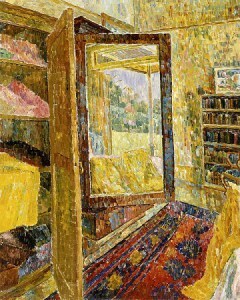 Later in life, she made an brightly colored series of interiors of her Sydney home, such as this one, Interior with wardrobe mirror, 1955. I recommend the NGA’s permanent website of Grace Cossington Smith’s works.